Playing board games is his forte. How many syllables did you give the word ‘forte’? Wrap me up and call me “hambone” but the correct pronunciation has only one syllable. for·te (fôr'tā', fôrt, fōrt) pronunciation n.   1. Something in which a person excels. 2. The strong part of a sword blade, between the middle and the hilt. [French fort, from Old French, strong, from Latin fortis. See fort. ]SYNONYMS  forte, métier, specialty, thing. These nouns denotesomething at which a person is particularly skilled: Writing fiction is her forte. The theater is his métier. The professor's specialty was the study of ancient languages. Mountain climbing is really my thing.USAGE NOTE   The word forte, coming from French fort, should properly be pronounced with one syllable, like the English word fort. Common usage, however, prefers the two-syllable pronunciation, (fôr'tā'), which has been influenced possibly by the music term forte borrowed from Italian. In a recent survey a strong majority of the Usage Panel, 74 percent, preferred the two-syllable pronunciation. The result is a delicate situation; speakers who are aware of the origin of the word may wish to continue to pronounce it as one syllable but at an increasing risk of puzzling their listeners. Last night, six of us gathered at my house to play a few games. We split into two tables so that one group could get started while my group waited on the sixth. 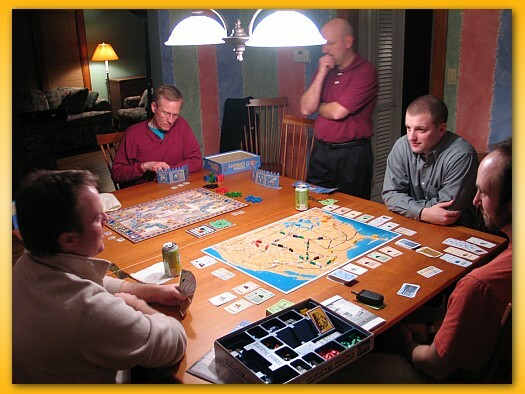 The group on the big table tore into Railroad Tycoon since space was readily available for the ‘big game’. Jason, the most experienced player, ended up winning the game. Brian and Brandon said they liked the game but would like to play it again with more players. The game apparently played out as triple solitaire. I have yet to play the game with more than three but the size of the board certainly lends itself to playing with a minimum of four to increase the likelihood of conflict. When John showed up, my table sat down for Tigris & Euphrates. Having played recently I felt much more prepared to teach the game to two new players. I lost miserably but mostly due to repeated failed attempts (in different colors) of one player attempting to merge kingdoms in external conflict granting large numbers of cubes to the third player. My penchant for drawing very low numbers of red and blue tiles didn’t help my chances either. But in reality, I think it was my lack of experience that inhibited me from capitalizing on any advantage I may have had. I still like T&E very much. Yes, there is the luck factor in the tile draw but I think the negative impact of bad draws can be minimized. At one point in the game I said, “I just don’t think by brain is smart enough to see what needs done.” There’s something to be said for a game that makes you feel like there’s almost always something useful to do but you just can’t see it yet. I’ll just have to keep plugging away and get more games under my belt. I respect a game that requires that of the player turning a sound thumping into a desire to play again. Brandon cut out between games so our second game was Mission: Red Planet for five. This was a new game to all of us and has a much different flavor than the games I play with my monthly group. The game certainly has a heightened sense of schadenfreude by allowing players to kill other players astronauts, blow up ships, trigger accidents on the planet, etc. I had a great time even if I did come in last. 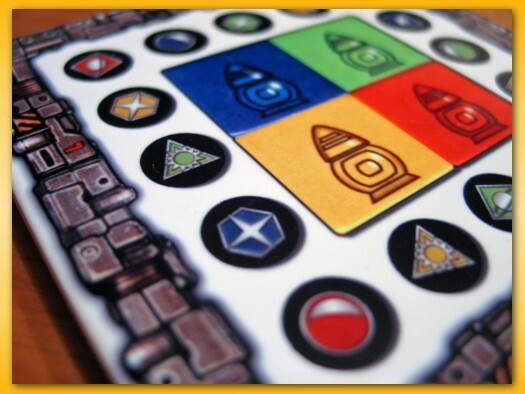 The game is extremely simple to play and chaos reigns. But if you know that going in and the point is to just have some fun, then I highly recommend it. I need to get some little plastic astronauts to take the place of the wooden discs though. Bob brought Taj Mahal and John brought Shogun both of which I’m itching to try. Forgive me for the picture-less post. I like to include an image or two with each gaming post but I was just too busy losing last night to think about grabbing the camera. Thanks everybody for coming. Let’s do it again soon. Here are a series of 10 youtube videos covering mostly the game Tigris and Euphrates. Part of episode 9 and episode 10 cover the future (now the past) and other games like Lord of the Rings. The rest of the episodes focus directly on T&E. 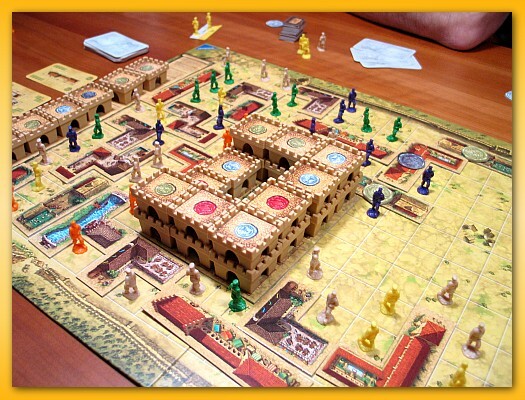 Reiner Knizia, the designer, speaks (by phone) on game design, theme, strategy, mechanics, play testing, and more. They were produced in 2000 when Mayfair Games first brought T&E to the US market. T&E started out as an epic 3-4 hour game and completely engrossed his mind such that he could work on no other game. Playtesting began on Aug 23, 1995, to almost complete failure. But with some rework, they had a prototype by the 31st. It’s very interesting to hear Reiner discuss the removal of concepts to simplify the game including a military leader that could become a dictator in a kingdom and grab victory points as if he were all colors of leaders. This dictatorship formed when more military tiles destabilized the religious influence in the kingdom. In addition, if people (black) out numbered farmers they’d begin to starve, revolt, and kick out the farming leader for mismanagement. 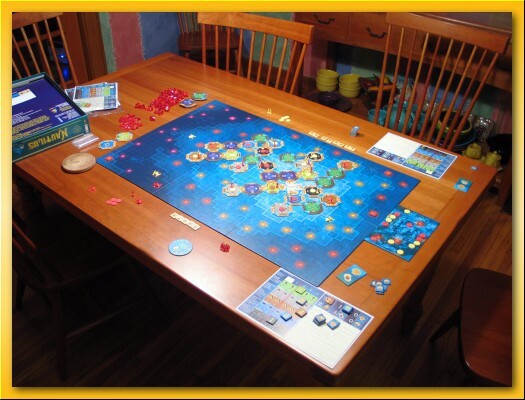 His interest in the complexity of the game began to lessen with the war-gaming aspect of resolving conflict and the monitoring of tile counting that was necessary to play well and accurately. He didn’t like this due to what he considered unnecessary complexity. After simplification it began to solidify into the jewel that it is today. For the rest of the videos, click the read more link. With the almost 20 inches of snow dropped on us in the last few days, the board games just had to come out. We invited some friends over and we first went sledding and for a walk in the woods. 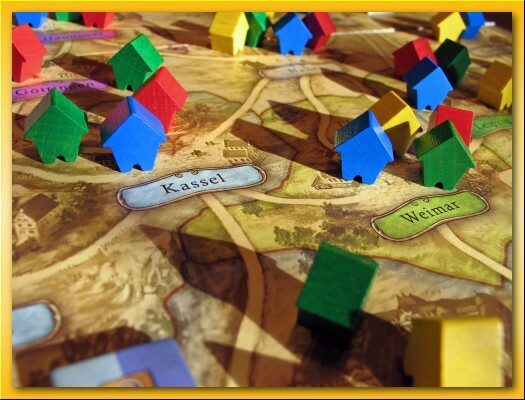 And then after a quick lunch, we sent the kids out in the snow to play and pulled out Thurn & Taxis – Power and Glory. The husband of the couple is in my normal gaming group so he is at least familiar with the style of games I have in my cabinet but his wife is not a ‘gamer’ by any means. However, once the game got under way I think she started getting into it. I had a great time with the game and thought it was a good introduction for her since the game features little to no direct confrontational play which I thought might be turn off. After a break to play in the snow a bit we threw some dinner together, ate, and then broke out Thebes. I chose this game since it’s a step up in complexity from Thurn & Taxis but shares some common elements in play: a field of face-up cards and an action to clear and replace all cards. I also thought, as a group, we’d enjoy the anticipation of the dig. As it turns out, I was right. There was an endless stream of whoops, hollers, and groans from the digs (especially when I miraculously pulled 6 treasures in a row for a 100% hit rate digging in green). 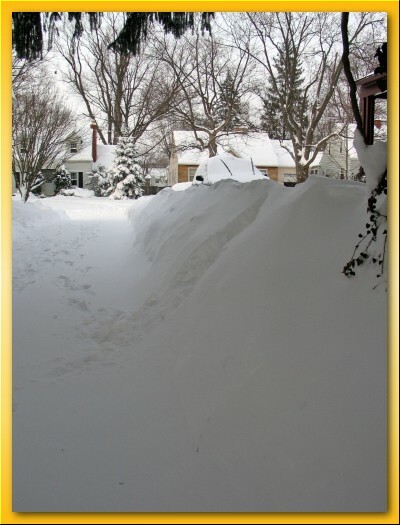 It was a an entire day of fun with friends playing in the snow, preparing and eating good food as a group, all surrounding the game play. A fantastic day. 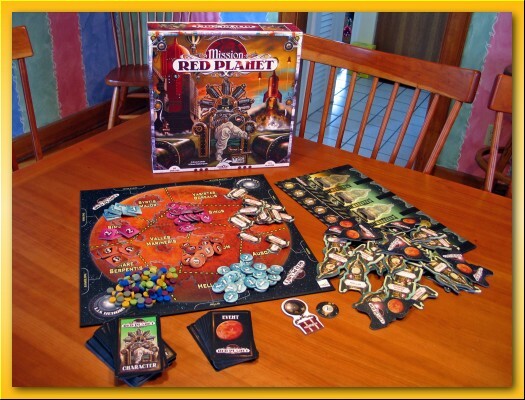 As luck would have it, my order from Game Surplus arrive the following day making me the proud owner of Mission Red Planet and In the Year of the Dragon. I failed in an attempt to trade for Mission Red Planet so I sold my copy of Pillars of the Earth for cash and turned the money over (with some additional cash) into these two games. I’m a big fan of Steam Punk and Mission has it all. 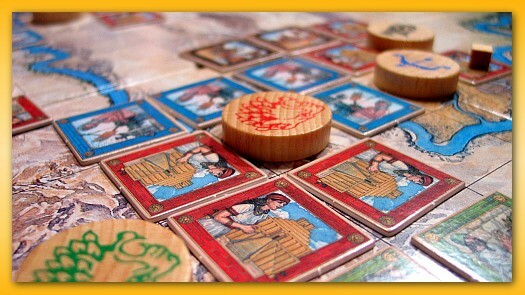 From what I’ve read, the game began with the theme and some artwork and they wrapped the design & mechanics around it. Somewhat backwards from most games but I’m all for it if it turns out looking like this one does.Mission hold quite a bit of chaos and elements of backstabbing but I don’t have many games of that sort and I think in the right moment and with the right group it can be quite fun. 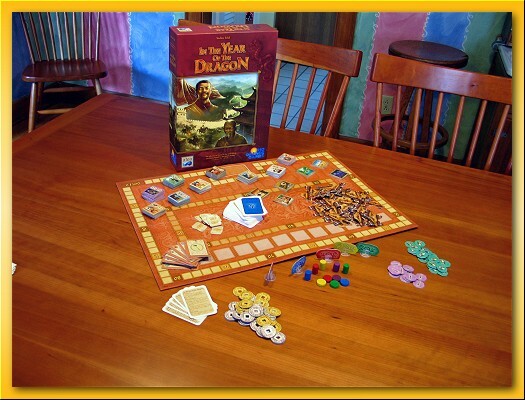 In the Year of the Dragon is a more serious game with a victory point engine at its heart likened to Notre Dame. However, instead of just plague-ridden rats there are many bad things thrown your way all trying to tear down your engine and your ability to keep everything running smoothly. The game has been described as brutally difficult to keep the engine going. A great theme and a strong set of mechanics can’t be all bad. Sounds like fun. In between shoveling the driveway five times trying to stay ahead of the foot of snow that fell last night and today, Lisa and I broke out Nautilus, a game I recently picked up in a BGG trade. The kids walked down the block to a neighbor’s house to play in the snow so we figured we had a few hours to kill (re)learning the game. I’d read through the rules before hand but we still took a leisurely stroll through the setup, drinking tea and chatting about the snow. About the time we were ready, the kids and our friends showed up so we broke for more tea, scones, and some popcorn. Getting back to the gaming in a few hours, we drove straight through to the end with Lisa pulling out the win by 4 points! She played very well. 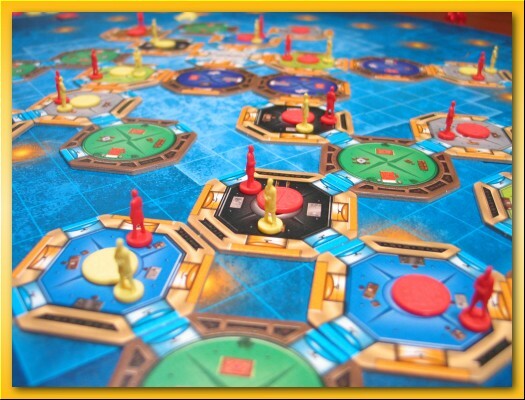 Nautilus is an enjoyable game with a relatively strong theme. It is however, a little on the long side for what it gives back. The game is not an economic engine style of game where you need to build/consume/produce/sell items driving victory points and/or money and for that I’m actually grateful. I already own several games of this nature so its lack of it compliments my personal library very well. Nautilus is a game of exploration. You begin the game with the bulk of the money you’ll have for the entire game. There are two ways to earn money during the game but in general your supply trends towards zero (or close to it) at game end. Your turn comprises three phases 1) buying and placing manned habitation and unmanned research modules on the sea floor, 2) moving researchers around the network of connected modules and activating research modules, and 3) launching and driving subs from an activated research module out into the ocean in search of treasure. Activating one of the five module types with a researcher grants you the ability to move up chits on a ‘scoring’ chart that grant not only more powerful abilities but the potential to score higher at game end. The activated research module types determine how far you can move your researchers within the station, how far your submarine can move, the effectiveness of your sub’s sonar, how many hidden treasure chips you can peek at when you uncover an Atlantis treasure, and how much money you’ll receive when you uncover a treasure chest. There are also various forms of other treasure that when collected by your sub, affect your score. All of these treasures come together to form an overall score and it’s this score that is multiplied by a score you receive for the number of activated research modules. This final product plus the money you have left at game end represent your score. The game does lends itself to analysis paralysis in that players may take a long time over analyzing their move. Other players can use this time to plan to some degree but your options may change dramatically based on another players move. Money management is very tight throughout the entire game and players will strive to minimize cost. To do that, one needs to determine when to place modules, how many researchers to deploy with your habitation modules, and where and how often to dig for treasure. Although the game is relatively complex and of a different style than she’s accustomed to, Lisa and I had a good time and I look forward to many more plays. Lisa commented that she’d need to play it several more times before she could begin to feel comfortable evaluating a good move from bad and how the finer details of that move can affect future options. The final scoring had her stumped and she was truly amazed that she pulled out the win. It really came down to my spending a few extra bucks to protect a lead in the sonar module that proved unnecessary. Had I instead, gone for dominance in another type of research module I probably could have pulled out the win. I’ve not played this game since April of 2006 at a CABS session that drug on until about 4:30am. It was the memory of that single play that triggered my desire to perform the trade in the first place. I’m happy with it and look forward to introducing it to my normal game group.As a side note, Nautilus comes with paper money in two denominations. Having extra “Rubium” from a money replacement in Nexus Ops, I used some of that to give the game a better tactile feel than the paper even if it is somewhat out of context. Maybe the gems represent goods found from previous expeditions. To maximize the gaming by streamlining the process. I’d much rather play two meaty games than one meaty game and a light filler. So, on Sunday night while perusing my game cabinet, Lisa started chuckling and asked me why I work so hard at planning when I know it’s not going to work out anything like I’d expected or hoped. Of course she’s right…she always is. So I resigned myself to just wing it and not feel responsible for the happiness of the group and to remove some stress from my gaming experience. Just go with the flow so to speak. So Monday night arrived, and five people stood in my dining room with expectant eyes. We all stared at each other for a bit before two people said they had only enough time to play one meaty game due to starting a new job the next day and having to open up the church for Ohio’s primary voters the following morning. So, I recommended splitting into two groups to shorten the playing time for those that needed to leave and to allow for the opportunity to play one of my 3-4 player games. The other group decided to play Union Pacific since, as a group, they were the most familiar with that rule set. My group, on the other hand got to do something I’ve been hoping for for weeks…years…yes…Tigris and Euphrates. But wouldn’t you know it, I was ill prepared to teach it well and it had been awhile since I’d played (almost exactly two years!). So, after stumbling through the rules we finally got started and in the end I think we did okay. This time, I remember no rule infractions and having now only found the reference to my previous play (fiasco? ), it’s difficult to not have done better. In any event, I would love to establish T&E as a more regular game for game night. Similar to Caylus, there’s just so much going that it feels like there are always positive options and many, many paths to victory. Although I’ve only played a few times, T&E could easily be my favorite game. The Union Pacific group finished slightly ahead of our game due to a game ending double dividend situation with many cards left in the deck. After boxing up the two games and saying our goodbyes to the early nighters, we dropped down to four and I pulled out Arkadia. 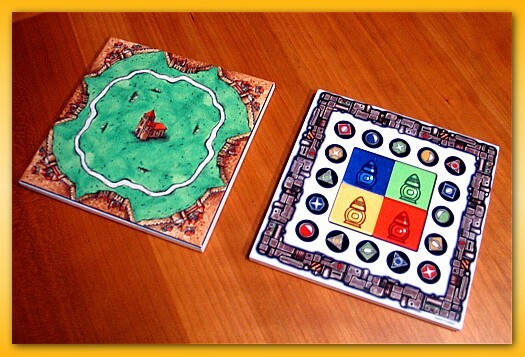 Lisa and I enjoy Arkadia as a two player game but I have played it at a game night in the past with four. However, this time, the three other players were new to it. It started off a little clunky; probably my “winging it” approach affecting my delivery…oh why do I listen to my wife! There was a fair amount of confusion over when you can use your architecture banners, when you are allowed to evaluate your holdings, what cards are useful on the draw, and how many people to place seemed a crap shoot to everyone. However, as the game progressed I think it started to grow on them and by the end they’d gathered some more respect for it and its subtle features. I like the game with two and with four, although different and more difficult to score big, it’s still a very enjoyable experience. We tend to play without the screens to take away the memory/tracking aspects of the game which seem to just increase mental work without increasing fun. Keith, purchased a couple of coasters from The Board Game Gift Shop so I thought I’d share some close ups to give you all a chance to see the kind of quality you can expect. 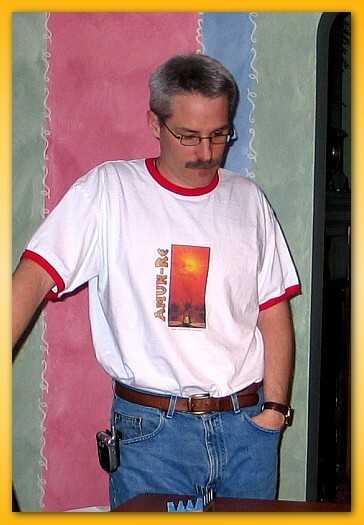 Not to get overly promotional but I was wearing an Amun-Re shirt from the store as well.